Great quality rosé wine is made everywhere these days — not just in Provence! This summer, expand your horizons and travel around the world by opening one of these dry, flavorful wines from Hungary, Lebanon, France, Italy and even the good ol' USA. Let's start with the rosés of Rhône, Provence's neighbor. Wines from both regions typically use many of the same grape varieties (Grenache, Syrah, Mourvedre, Cinsault, Carignan) but the Rhône style tends to be bolder, with a bit more structure and weight on the palate. Domaine Les Grands Bois Cuvée Les 3 Soeurs, 2017 ($13) - A beautiful rose petal color, this Côtes du Rhône rosé is made from Grenache and Carignan. The Domaine is farmed organically with soils of of chalk and clay and the resulting wine is very aromatic on the nose with the scent of red berries and fruit jellies. On the palate it's light and fresh, yet with great length and texture and a hint of spiciness. Pair this wine with lighter summer dishes like salads, seafood and light meats. A beautiful, light pinkish salmon color, this Côtes du Rhône rosé paired well with the artwork of Serge Bloch! Vidal-Fleury, Côtes du Rhône Rosé, 2017 ($13) - A brilliant, pinkish salmon color, this Côtes du Rhône rosé is made from Cinsault, Syrah and Grenache. The intense nose of raspberries, caramel and white flowers carries over onto the palate with a weighty texture and a long, silky finish. This is, as the French say, a "gastronomique" wine, a wine for food. Its bright acidity makes it an ideal accompaniment to all kinds of food, from light salads to grilled lamb chops. 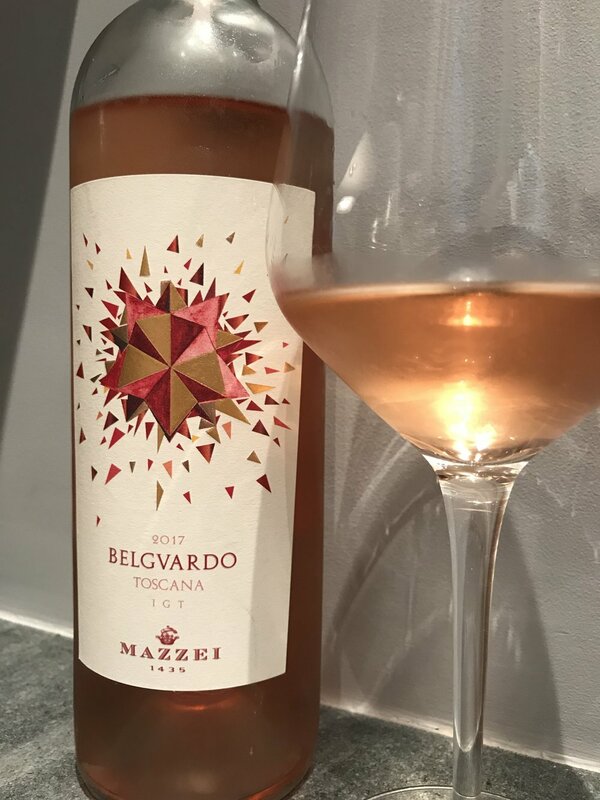 Mazzei Tenuta Belguardo Rosé ($15) - Made in the Maremma area of Tuscany, close to the sea, the grapes are hand harvested and then macerated on the skins for 12 hours. This unusual blend of 50/50 Sangiovese and Syrah has a light pink color and intense aromas of cherries and white flowers with a hint of licorice. On the palate, it's medium-bodied but full-flavored, with a bright salinity and a long finish. Pair with appetizers, tomato based pasta, pizza, steamed fish and vegetables. Castello Monaci Kreos Rosé ($16) - This wine, made from 100% Negroamaro is produced by Castello Monaci, a historic property with a 16th century castle on its estate of 350 acres of vineyards. In the heart of the Salento region of Puglia, the vines are exposed to brilliant sunshine all summer long, but also to the cooling breezes coming from the nearby Adriatic and Ionian seas. The resulting rosé is fresh and lively with beautiful red berry flavors. It's a dry, full-bodied rosé (Negroamaro grapes make big, bold red wines) that pairs well with everything from cheeses to salads, vegetables and all kinds of meat. Dúzsi Tamás Kékfrankos rosé, 2017, ($14) - Made from the Kékfrankos grape, also known as Blaufränkisch, this variety typically makes mouthwatering, fruity and spicy rosé and red wines. The aromas and flavors of citrus fruits: grapefruit, lemon and lime, along with tropical mango are enticing. Delicious, refreshing, crisp and dry. Pair with seafood, salads, pizza and pasta. I discovered the wine at Otway Restaurant in Brooklyn, included in the Wine Enthusiast's "100 Best Wine Restaurants of 2018". Massaya Rosé, 2017 ($16) - Hailing from the hills of the Beqaa Valley, this pretty, pale salmony pink rosé has subtle aromas of red fruits and spices. Made from high altitude Cinsault, Syrah and Cabernet sauvignon, the wine has a beautiful freshness on the palate. Pair this rosé with everything from hummus, grilled eggplant and red pepper dip to all sort of grilled fish and meats. Read the story behind the winery at GrapeCollective.com. 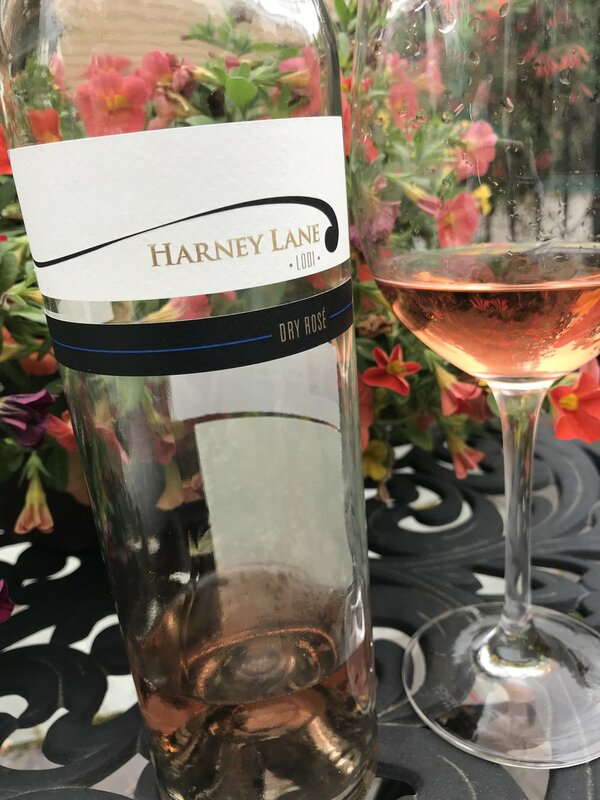 Harney Lane Dry Rosé, 2017 ($18) - Family-owned Harney Lane Winery has a long history of farming in Lodi, California, an area seated between the San Francisco Bay and the Sierra Nevada mountain range. The rosé, made from Zinfandel, Tempranillo and Petite Sirah grapes, is a light pinkish salmon color with aromas of citrus zest, crushed red berries and a salinity reminiscent of briny oysters. On the palate, there are distinct savory notes of herbs and fresh vegetables. The bright display of fresh fruit flavors intermingle with both creamy and mineral textures on the palate. Pair with salads, seafood, particularly shellfish, and grilled meats. Winner of the Silver medal at the 2018 International Women's Wine Competition. 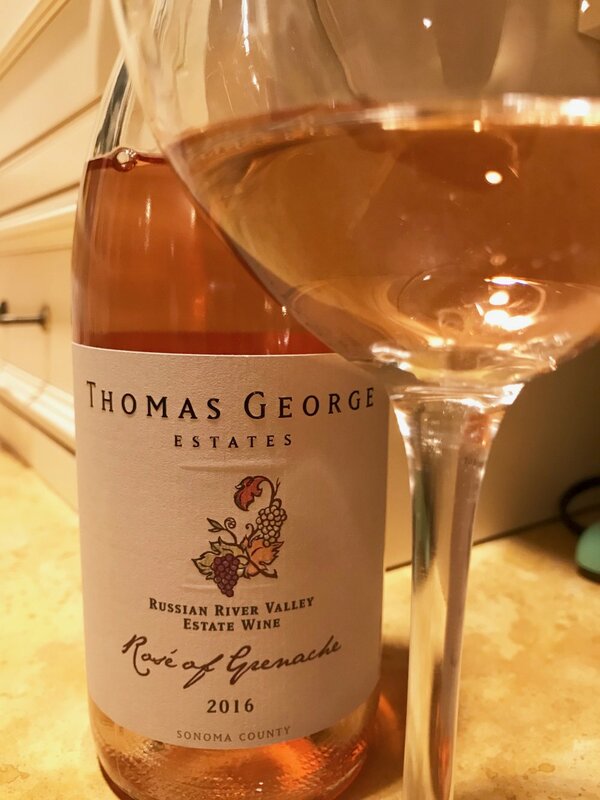 Thomas George Estates Rosé of Grenache, 2017 ($20 for wine club members and $25 for non-members at ThomasGeorgeEstates.com) All of the wines of Thomas George Estates are small lot (only 303 cases of this rosé were made), artisanal, single vineyard estate wines produced in Russian River, Sonoma. Crafted from 100% whole cluster pressed Grenache grapes, the rosé is a beautiful, rich pink color with aromas of fresh strawberries and raspberries. Energetic and lively on the palate with a long finish, pair this wine with everything from soups and salads to pork and lamb on the grill.